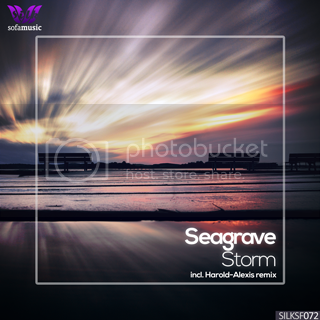 Featured on Seagrave's recently launched debut album on Silk Sofa, "Storm" now gets its own single release, including an intricate remix by Harold-Alexis. An accomplished label veteran who hails from Canada, Harold-Alexis joins us after his successful remix of Gregory Esayan's "Innerspace", which was even featured on several prominent American news channels (CBS and FOX). The Original Mix of "Storm" starts off with soothing pad layers and an intriguing bassline. Seagrave's haunting and beautiful vocals emerge, combining gorgeously with a light piano line in the background. Harold-Alexis provides a downtempo interpretation, which quickly establishes a groovy, mesmerizing rhythm, further enhanced by numerous lush melodies and sound effects. A stunning piano theme gives extra texture, which suits Seagrave's vocals perfectly.